Could’nt agree more. This is crazy. @Alexandre – the last update of Ebroidermodder was 2006, and the description says it’s for modifying existing designs, not converting vectors into stitches. Is Embroidermodder 2 something completely different? Embroidermodder is a design app indeed, and v2 is an upcoming major update by a different team of developers. Regarding conversion from EPS, SVG etc. — I haven’t looked at it for a while, so I’m not sure. You can ask Josh and Jonathan about it, though. They are awesome folks. You should have my email now from the comment form. Trying to contact people thru sourceforge email relay unfortunately isn’t straight forward. There are exciting things happening in the development area and we have many great features coming. I have an old yellowed cutout of Nina’s Adventures “Think outside the Box” from back in high school 🙂 Its good to get in contact with you. Alexandre gave me the heads up. It would be great to collaborate with you on some of your design ideas. Great! Thanks! I emailed you. I am a free motion quilter, and you really hit the nail on the head as to why I have zero interest in an embroidery machine. It’s fascinating how sophisticated the machines have become, but I have absolutely no interest in having a machine that can put existing (can costly) doodles and designs onto my quilts. I would immediately change my mind if I could easily turn MY doodles and designs into embroidery. You’re so right! I have a popular Brother embroidery machine that I got from my husband for Christmas. He bought a large accessory pack to go with it. Neither of us knew we’d need software too! A friend of mine has a very expensive Huskvarna Viking embroidery machine and invited me to attend a seminar about how to use that type of machine and their software. We both thought I’d walk away with some inspiration, which I did. I was told by an instructor there that I was in luck. I could buy their software and use it with my machine! Woohoo! What? It’s 30% off today only? What? 30% off makes it only $800+??? That was more than the cost of my Brother machine! I have since purchased a simple lettering software from Amazing Designs called Letter It ($99 eBay). It does everything that I want it to do since I really wanted to personalize and monogram. I can add lettering to any design that I have, and I have many to keep me busy. I’m sure I’ll want to graduate to more complex things, but for now I’m happily using my embroidery machine! I completely agree with all of the points you have made here. The software for these machines are so expensive, almost absurdly so. Please post a follow-up if you find anything! I was looking at getting a embroidery machine, but I hit the same realization you did with the software. My workflow is exactly the same too, where I am using a Mac and creating vector artwork with Illustrator to be digitized. There’s NO WAY I want to use any of those gaudy embroidery designs that come with the machines or can be downloaded either, so an embroidery machine is useless until I can make custom designs. I agree. I have the Husqvarna Viking 3D professional which is now obsolete. Viking won’t even answer any questions regarding the 3D. They told me I had to upgrade to 4D before they would assist me. Now, they are up to 6D software. I can’t afford the software. The 3D will only work on Windows XP. It won’t work on my new computer (windows 7). I don’t know what software to get. the sewing machine/software companies figure if we want something bad enough we’ll pay their price. well, not me. I will keep looking, but will continue to use my 3D on my old slow computer. Would kill for a useable embroidery machine for small quanity of unit/team badges for some of the scouting and roller derby groups I am involved with. The software makes it a no brainer. Waiting for some genous to mach an android app for that. I just pulled my old embroidery machine out. Its a Brother Pacesetter 8200. My PE Design software is version 2.0, windows 95! My designs are on floppy disc if you can believe that. I had a good laugh until I realized I am at a loss as to where to go from here. I’m not interested in digitizing. I would rather purchase a design from a company like Amazing Designs. I’d like to Monogram too. I really do not want to upgrade to a newer machine. I was hoping to get some advice on the software available now. Any help would be appreciated. Learning to digitize embroidery takes years because the software is such crap. Nothing is properly automated so you have to do everything manually if you want it to look remotely OK. It’s really stupid. To anyone familiar with decent graphics software, like Photoshop, Illustrator, Flash, Inkscape, etc., existing embroidery software is an outrage. we use this program. it works ok and the price is ok.
it is a steap learning curve like adobe programs. so you have to have some software experience to use it. Did you try Corel Drawings? It works with .eps and .ai basic vector files without any problems and it’s way more professional than the usual software you get with that “for home use”-embroidery machines. Maybe it’s because of the typical buyer being not that keen on (or even capable of?!) making own embroidery designs of very high quality…? Singer has a software called Autopunch that comes with their Futura line. It has a program that converts vector files to embroidery files.The language it reads are .wmf files and .emf and it can also read a .bmp image. I dont really know the difference. I just know that I can doodle on a piece of paper scan it into my computer and then open it up in the Autopunch program. The problem is that the machine sews out poorly and it is fraught with issues. The good thing is that you can save the designs in any language that Other embroidery machines can stitch out in. 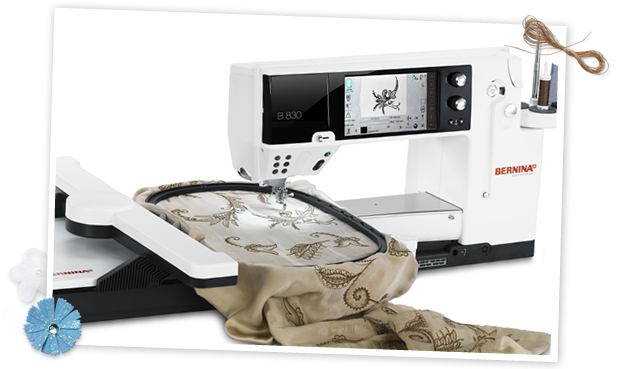 So I design with the Singer software and stitch out with my Babylock Spirit which sews like a dream. You are lucky that you can play with the software and get something good. I am terrible with the vector stuff. It also has a software that turn photographs into embroidery design, but you have to be good with Photoshop in order to eliminate the unnecessary shadows and reflections. The embroidery brand that most of my embroidery friends really like is Compucon. They sell great software. I have the photograph one. Embroidery digitizing vet here (6 years, two companies, table/puck to modern overlay GUI). It’s a niche market whose userbase is so small (inclusive of both home embroiderers with smart sewing machines, and production environments) that it’s necessarily vertical in its business model. High-end security software and some utilities are likewise necessarily expensive to continue the developers’ companies. To put this into perspective, the workstation I started out on was a 386 PC with a 13 inch VGA monitor, an internal iOmega backup device, a digitizing table and a puck; the software was still DOS-based. At 5 workstations, this cost my employer $15K each. The current requirements are more modest but the vendor’s website still requires contact with a salesperson to get a quote, and they’re arguably the most successful company in the field. Independent developers have to start from scratch; the designer software may not be difficult to write, but it has to support a number of machines, many of which have ancient, proprietary, unpublished data formats which require reverse engineering (and in at least one case, the disk’s format itself is proprietary). There’s no guarantee that software branded Singer or Husqvarna actually belongs to the company either; the bulk of the software license cost may be going to the original developers (I don’t know for sure, but at least one version of a well known manufacturer’s software was an unauthorized copy of someone else’s which led to it being pulled). As far as digitizing itself taking a long time to learn, it takes about six weeks to learn the basics of production digitizing and about six months to master it (in a production environment). The software itself isn’t the issue, it’s the reality of punching designs for multi-head embroidery machines which run at much higher speeds than someone’s home Singer machine, and on materials as unforgiving as pique (i.e. Lacoste style woven cotton shirts). Anyone can learn to make satin stitch, flat fill and bean stitch designs; the skill comes from all the tricks necessary to make sure color stops stay in register, flat fills don’t distort the fabric, and finding ways to represent fine detail when the medium doesn’t normally support it. It’s a challenging field for people who enjoy puzzles, and it looks simpler than it is. It would be nice if a developer made cost-effective digitizing software for home equipment (akin to Photoshop Elements), but the incentive is very small to an already small industry. I was going to say basically what Andrew has just written. I have been working with machine embroidery since 1998. I began with a degree in fashion design, worked in that area for over 30 years, then went into machine embroidery in a commercial retail setting. Digitizing not only requires knowledge of software but also of fabric, needles, threads and stabilizers. Digitizing is a skill learned like a pianist or oil painter would learn through practice and lessons to become proficient. There are many, many software packages on the market that will do “auto-digitizing”; however, one still needs to know what parameters are needed (fabric type, underlay, compensation, etc.) for the auto settings and know when to use them effectively and when to just punch each stitch. What you wish to do is more like auto-digitizing. You most likely would not be happy with the results. Your idea is wonderfully clever, but if you’d like to sell the designs (and you retain copyright) have a professional digitizer do them for you; it will be money well spent. I have limited sketching skills to create my own artwork so rely on websites that sell artwork for emboridery to digitize from. Perhaps consider creating several characters and sell them as artwork for embroidery on a website. Search the internet for ideas of websites. We digitizers are always looking for new artwork! Also, consider partnering with a digitizer where you create the artwork, they digitize, and you split the sales or let them sell their digitizing on your website featuring your artwork. There are a ton of possibilities. I have spent hours and hours and hours and hours perfecting the craft of digitizing. It’s not only digitizing but also all the testing and edits to perfect each design then testing again. The software is expensive for a reason and many many people purchase it at the insistance of a sales peson only to have it sit on a shelf never learning it because they don’t want to devote the time it takes and purchasing well-digitized designs is easier and more cost effective after all. To whom it may concern, I have Huskvarna 3 D software and have continuesd to up grade my computer to windows 7 and have still been able to use 3D. You have to go into Huskvarna web page site and download the upgrade to make the dongle assessable to the new windows. I refuse to pay more for the upgrade of 4d and newer. Please try it, as it works for me. The dealer where I bought my machine and software told me It wouldn’t work and needed to upgrade my software. But it does work as long as you download the upgrades for the dongle. I may have found the answer. I convert images with this program and then use the singer autopunch to stitch them out. I have read all these comments with great interest. While the original question was about mac software for embroidery machines we seem to have drifted just a bit. I have Janome machines and adore them all, they don’t speak mac and I was terribly disapointed when I learned this after I bought my first embroidery model. I do all my work/life on a mac and always have. My pc died after two years and I swore I would never waste money on another, and I won’t. Since my Janome can’t accommodate my embroidery interests I haven’t done any over the years but lately I have become interested again. Does anyone have any updated info since this post started a few years ago? @Luis-I got my degree in graphic design-I must say I it was a bit of wasted time since anyone with a pc thinks they are designers now. Have you looked into TruE for MAC? Molly, Embrilliance works on Macs and PCs. It is relatively inexpensive for the basic module. Embird software is wonderful. If you keep up on the upgrades, they are free. If you lapse (skip a version or 2) upgrades are inexpensive. **there is no dongle required. ** You purchase only what you need. Basic Embird allows you to change size, format, colors, has a stitch-out property that I think is great, as my “inexpensive” machine does not have a computer screen, and I can run it along side the embroidery machine (makes it easy to change things as you go along, or skip parts if you like). I understand it also works to split designs, although I have not done that myself as I use smaller designs. There are modules you can later add for digitizing, cross stitching, Photo stitching and creating fonts. You can also try it free for 30 days. Can i use machine embroidery thread for regular machine sewing? I have many spools of machine embroidery thread. Can I use these for regular machine sewing? Do I have to adjust the tension on machine? Seems like the embroidery thread might be thinner than regular sewing thread. I have been writing it for about 5 months is pretty good now. Has anyone found any suitable software for a MAC yet. I have lots of beautiful doodles that I want to make into patterns. I can’t find anywhere that I can be taught how to do this. I can’t find software for my Mac that doesn’t cost the earth. I have a machine that could be keeping me in full time work if I could find the software to make my doodles into patterns. Failing that, does anyone know of a good company that will do it for me? The new Viking machines are not even made in Sweden anyway. My old #1+ works just fine on XP. Many computer shops have old XP Pro laptops for sale for $100 or so. Viking is no longer the same company. They do not support old dongles, so if you never activated the dongle you are out of luck. But it is no big deal to get older programs and reader writer boxes working on XP if your dongle is activated. Me? I am looking at the Avance single head 15 needle machine. Watch the video and listen to the professional MEN laugh at how we old ladies are so dumb and still barefoot and pregnant at the mercy of companies like Pfaff and Viking. 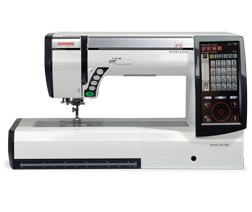 I have used this Domestic Embroidery Machine, it is really nice and user-friendly.